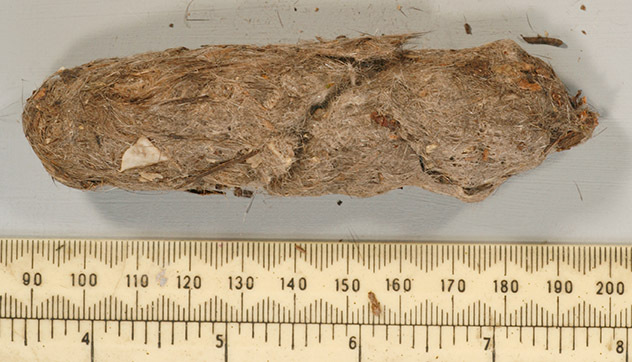 A pellet consists of the indigestible parts of an owl's recent meals. Within the bird's gizzard these parts form into a pellet over the course of one or more meals. Once formed the owl cannot eat until the pellet is regurgitated. Owls are not the only birds to produce pellets, but their habit of swallowing prey whole (or in large pieces) does mean that most individuals will produce at least one or two per day. Much information about an owl's diet can be gathered form examining these pellets. 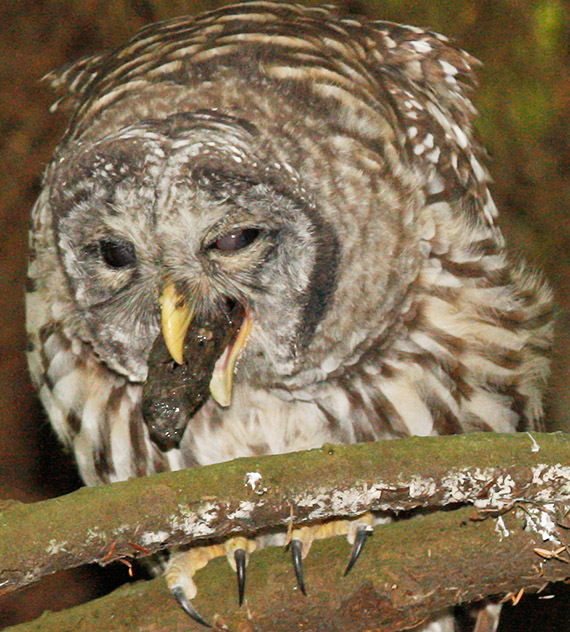 The photo at left shows a juvenile Barred Owl actually producing a pellet. The contents of this and other pellets are shown below. Pellets are much like the fur balls produced by cats or dogs, but in the case of owls skeletal material and even feathers (the prey's not the owl's) are included. It is not "puke" as such. A word of caution: if you collect pellets yourself you should be aware of potential health hazards. Essentially you are handling raw food and as such the risks of such things as Salmonella poisoning are present. You're probably more at risk from poorly cooked chicken, but why take any risks? When collecting pellets I find plastic sandwich bags can be easily placed over the hand to pick up the pellet then fold back and seal. If you own a dog you may be familiar with the technique - though applied to the "other end" of your pet. Pellets are much less offensive to human sensitivities. Note that the partial measurement scale shown at the edge of some photos is for millimetres. I would be grateful for any help in identifying the contents of these pellets (I have more if anyone is interested).